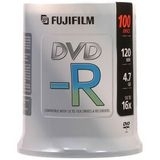 To achieve high-quality recording and a high level of durability, Fujifilm CDR, DVD DVD+R ,DVC utilize a high-performance dye material (storage layer) and Fujifilm DVD+RW discs utilize a high-performance phase change material which is ideal for mass storage and long archival life. If you have any questions or hesitations please give us a call at 619-684-5241. We work for you!